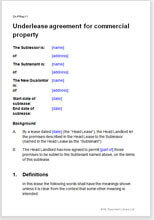 This document allows you to carve out a sub lease from a head lease with the same terms, or alternatively, to specify different terms and impose further obligations on the new tenant. Using this template, your agreement can follow or deviate from the original as much as you like. the whole of a property to a single new tenant so that the original tenant is effectively replaced by the new subtenant. This agreement is suitable for any commercial property including office buildings, shops, industrial units such as workshops, warehouses and factories, and even land. Because underleases deal with legal issues in the round, the form of underlease required for a shop on the high street is not different from the form required to sublet a scrap yard. The underlessor should first check the original lease. Subletting may be allowed and if so, the permission is likely to be subject to specific conditions. If not allowed, you will have to go to the head landlord and negotiate. For example, it may be possible, with the landlord's consent, to increase the rent under the head lease in return for allowing subletting. This sublease is one of a collection of commercial lease templates designed for use by property professionals: experienced landlords, attorneys and surveyors. Accordingly, the provisions are very thorough. We offer two underleases. This version will be used for most situations. The alternative is for circumstances where the head landlord has required deeper and more detailed involvement in the relationship between himself and the new subtenant. You may be interested to look at: Sublease agreement for commercial property: landlord involvement.